Capitalism is a socio-economic system that encourages producers, resource owners and consumers to carry out economic activities with minimal or no state interference. It allows their actions to be guided by the concepts of private property, profit motive and consumers’ sovereignty. Under capitalism, the elements of production are privately owned and managed by individuals who enjoy maximum freedom in operating their activities within the scope of the existing laws of the land. They may buy, sell and manage their properties or firms at their will. As the individuals own the factors of production, they put in best efforts to make maximum profit by managing their business efficiently. Capitalism lays emphasis on profit motive as it is the driving force behind the employers as well as workers to make new initiatives which lead to their prosperity. Owing to the preponderance of profit motive, the prices of products get automatically determined by prices offered by the producers and choices of the consumers. The consumers indirectly but firmly dictate the types and quantity of goods to be produced and the way they should be produced to make them affordable to the largest segment. In a capitalist society, consumers reign supreme. They can buy whatever they like and how much they need. Producers also get induced to produce a wide variety of goods to cater for the needs and tastes of the consumers and make maximum amount of profit. Since capitalism allows maximum freedom to buyers and sellers, the capitalist market has a large number of buyers and sellers who compete among themselves to influence the market decision regarding the production, distribution, prices and consumption of goods. With the existence of free market, private property, profit motive and individual freedom accompanied by the minimal interference of state in the areas of production and consumption, the capitalist society offers the most congenial condition for the growth of consumerism. This gives the impression to many that capitalism is synonymous with consumerism. However, some distinctive features do exist between the two concepts. Consumerism is an ideology that induces individuals to acquire and consume maximum goods and services. It advocates production of goods by manufacturers according to the free choice of the consumers which ultimately orients the economic policies and programs of the state. It drives the consumers to be in a constant pursuit of a comfortable life, irrespective of its social and moral implication. Since the onset of twenty first century, consumption is growing at a fast pace, enveloping people from all classes, religions and nationalities. The growth of consumerism coincided with the growth of capitalism. Completion for market, profit motive and increase in technological productivity led to economic prosperity among different classes, necessitating the promotion of consumer culture. Availability of consumer goods following industrial revolution, emergence of the department store where a huge variety of goods belonging to a wide price range were available at a single place, triggered the habit of shopping and made it a permanent feature of leisure activity. The system of mass production by scientifically managed method of production such as assembly line also increased productivity to an amazing extent, making goods available at much reduced prices. All these factors which were integral to the capitalist economic system contributed to the growth of consumption. Consumerism’s maximum emphasis on consumption has its negative consequences. Purchasing and consuming goods in excess of needs develops a selfish attitude and promotes a ‘way of life’ that goes against the principle of simple and disciplined living upheld by thinkers down the ages. It makes human beings vulnerable to the wrong notion that economic growth is the answer to all problems. It follows from the above that capitalism provides the fertile soil on which consumerism grows abundantly. Pinaki Chakraborty. "Difference Between Capitalism And Consumerism." DifferenceBetween.net. 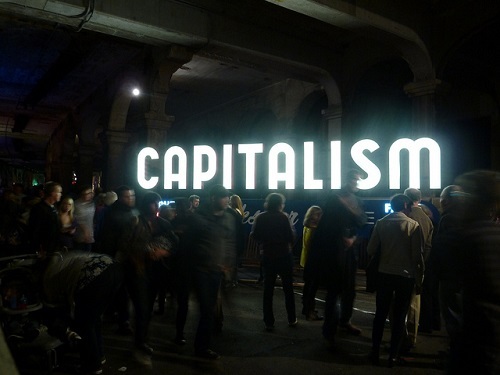 December 25, 2015 < http://www.differencebetween.net/miscellaneous/politics/ideology-politics/difference-between-capitalism-and-consumerism/ >. Excellent thread, however under ‘Consumerism’; shouldn’t ‘Completion for market, profit…’ be ‘Competition for market, profit …’.